The conception of serving can follow two strands: the Augustinian one ("Those who exercise a command do nothing but serve those whom they seem to command" - De Civitate Dei 19.14) or the more prosaic one of the Goldonian masterpiece "Arlecchino servant of two masters ”. Every minister of the Italian Republic is forced to carry the motto "servant of two masters" on the collar of the parliamentary suit. Emulating Truffaldino, the character created by Goldoni, each minister must indeed primarily to report on his work to the party that gave him the coveted job e in secundis he must (or at least should) look after the interests deriving from his competences. When one of the two masters takes over, and almost always it is the party-master, for the master-minister they are trouble. The most striking examples of this assumption have always had, needless to say, within the Ministry of Defense. 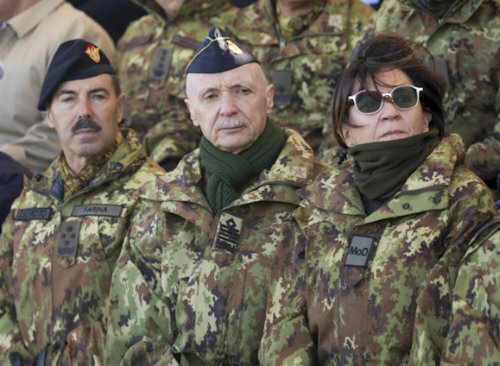 Minister Andreatta's decision to allocate 206 billions of lire from the budget of the Armed Forces to political parties that had been put under difficulty by a law that drastically reduced public funding caused a sensation. Also purchases of Olivetti PCs, Fiat AR / 76 campagnole and, more recently, Piaggio P.1 HH remote-controlled airplanes, useless for our Aeronautics, were used to rescue companies in crisis, obviously to the detriment of the already poor appropriations for the Defense. To keep up with the cannibalization of the military budget the new political class elaborated the dual use, a fraudulent English who stands for "dual employment" of the Armed Forces, a formula that provides, among other things, the permanent commitment of 7000 men in a mission with a captivating name: "Safe roads". It also includes the patching of the road holes in the capital, the control of Roma camps and, finally, some tasks connected with the collection and storage of urban waste. God alone knows what these activities have to do with the tasks foreseen for the Armed Forces by the Constitution and with the motivations that may have prompted a soldier to take the military path. Playing the big box around these initiatives, a smokescreen was actually created that hides the prince of problems: the military budget. It is above all the European allies of NATO that accuse Italy of allocating less than half to the Defense, in terms of percentage of GDP, compared to their commitment. To make even more smoky an already smoky curtain of his have been conceived then mystical reduction of military chaplains (if necessary, do it without propagandistic display) andemphatic exaltation of homosexual unions among the staff in uniform (given my past in the "Sassari", I asked myself what Captain Emilio Lussu and Raimondo Scintu, one of his soldiers decorated with Gold Medal, would have thought of). Then the mighty one was also proposed problem of overweight soldiers (an inconvenience that every soldier has the sacrosanct duty to solve on his own, putting his eating habits in order, dedicating time to physical activity and, if necessary, resorting to the national health service); finally, last good, the epochal was born unionization of the armed forces. With regard to the nascent union, it should be noted that in order to solve the problems of the military in particular, starting with the shameful delay with which compensation is paid for overtime (often transformed, reluctantly, in compensatory rest) the will of a minister would suffice. But to solve sic et simpliciter this problem would have been necessary that the Minister Trenta had shielded with his own body the cut of 500 million euro to the skimpy military budget ... but also in this case we would have been however thousand miles away from a lost search of the credibility of the Armed Forces. These should instead continue to struggle with less than 20 billion, compared to the 43 of the French and the 46 of the British. It is evident that in the ministerial choices the obedience "respectful, prompt and absolute" to the owner / party had the better, obviously, to the detriment of the owner / defense. With regard to the military syndicate, it should also be added that there remains the curiosity to understand how the minister intends to resolve the irreconcilability of two oxymorons: union / prohibition to strike or right to strike / execution of orders. In other words: if a favorable political will is lacking, a union without the right to strike is an outlet for a ride; if instead the political will is there, the military union is even more useless. The lack of credibility of our Armed Forces implies the impossibility of defending national interests and is destined to last over time, since it depends on the need to allocate a river of money for the coveted citizenship income and for migrant needs. Above all this second requirement will in fact make it impossible to reduce the costs for the food and lodging of the migrants themselves, for their health care and for the legal "free", without forgetting the maintenance in our prisons of that 30% of prisoners non-Italians and the costs of curbing delinquency in drug dealing, trade in counterfeit goods and the crimes that national information strives to minimize. It should also not be forgotten that the beneficiaries of the well-known citizenship income will be for the non-Italian 10%. Finally, as regards the defense of national interests and the prestige of Italy, it may be significant to ask ourselves some questions that refer to international affairs and to hypothesize the evolution of those diplomatic conflicts if a militarily credible country were found instead of Italy. First example: if i two marines Girone and Latorre had they been British / French / Israeli how would India behave? Second case: if instead of Italy had been the United Kingdom or Israel to have vital energy interests in Libya, Mr. Sarkozy would have equally bombed and destabilized Libya by undermining the ENI and leaving us the legacy of one million potential migrants who yearn to reach, with the connivance of traffickers, the Catholic world, enterprising businessmen and party cooperatives, the Bel A welcoming and tolerant country? Other exercise: Sarkozy and Merkel would they have sent the historic mockery to a representative from the United Kingdom or Israel? Again: if in February 2018 la Saipem 12000, the ENI ship which, preparing for a campaign of oil exploration in international waters, had beaten the English / French / Israeli flag, the unit of the Turkish navy would have imposed, in spite of international law, to turn back and heading home? And so for the cases Regeni and the inaction of Caesar Battisti. 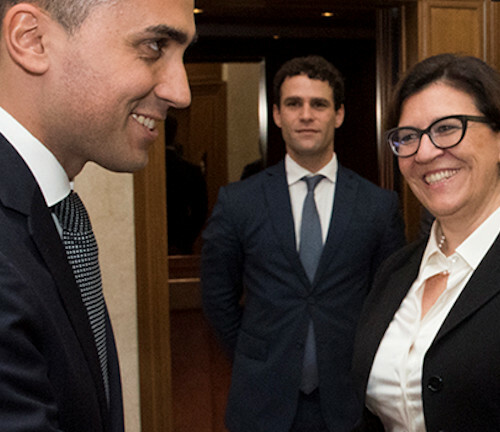 And because France has defined Italian politics as “vomitious” and not those that are sometimes just as criticizable as the United Kingdom or Israel; and so how come the Luxembourg minister Jean Asselborn has allowed himself to address the expression "merde" to the Italian Salvini and not to his French / English / Israeli counterpart? In reality, however, it must be admitted that not a few Italian people, precursors of Fabio Fazio, have taken a stand against the Italian government, proving to be conniving with the contender of the moment, especially if he is French, earning himself, in addition to an ill-concealed gratitude, an equally barely concealed contempt. In this context, the conferral of the Legion of Honor to the various Prodi, Veltroni, D'Alema, Fassino, Franceschini, Letta, Pinotti and others deserves some reflection. In conclusion: it is now clear that our Armed Forces under pentastellata management have hit bottom. Although the world is in dangerous turmoil, with many situations that risk completely escaping the hands of the contenders, as in "our" Libya, "it will take a lot of time and a lot of money to get our military instrument back on its feet". At least that's what Winston Churchill thought. But a premise of everything it appears essential that the management of the defense pass as soon as possible into hands that are less incompatible with the military world. Replica of the Hon. 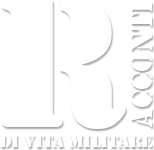 Alessandra Ermellino to the letter to Difesa Online: "Still slaps for civil defense officials"
Online Defense Letter: Is it time to clarify and do justice to the victims of depleted uranium?